Info "The rules of this quiz show are simple. Nod at the right answer. Don't move at the wrong answer." Smile and Nod is one of Young Cricket’s Microgames in WarioWare: Smooth Moves. 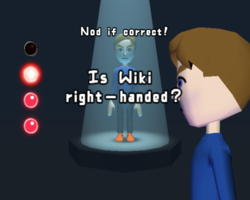 The player will be on a game show in the form of their Mii and will be asked a random question. If the answer is true, the player has to nod their head, but if it's false, they shouldn't do anything. Some examples of questions are "Is <player's name> male? "; "Is it 5pm? "; "In 6 years, will it be 2012?" and "are you using <name of the form>?" 1st level difficulty: A question is asked about the player. 2nd level difficulty: A question is asked about time. 3rd level difficulty: A tricky question is asked about time. This page was last edited on February 19, 2018, at 19:39.